Hey guys! I had a very good time building this and I wanted to share my result with you! Please let me know what you think! It's also open source. The code is here. This is awesome! Great color choices as well. This is really addicting and fun game. Thanks! 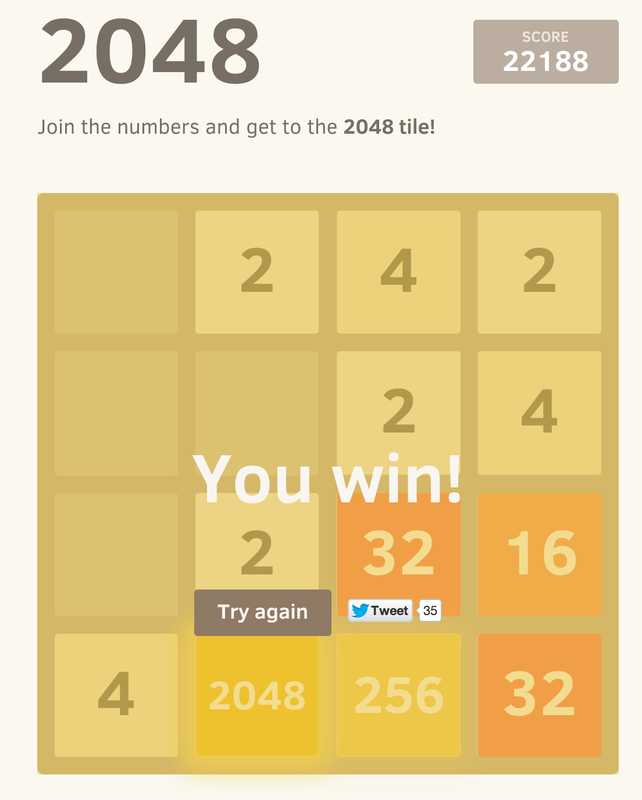 Holy crap, you got close to 2048! Experience in threes game helps, but this game is more interesting, because it has goal and damn I want to achieve it! Once I realized over 10k was high it did indeed get tense! 12,208 on my first try. And that certainly won't be my last! Cool game but it's frightening close to Threes (http://asherv.com/threes/) with no attribution at all?? Well, this is the first time I see Threes. I had never seen it or played prior to making the game. 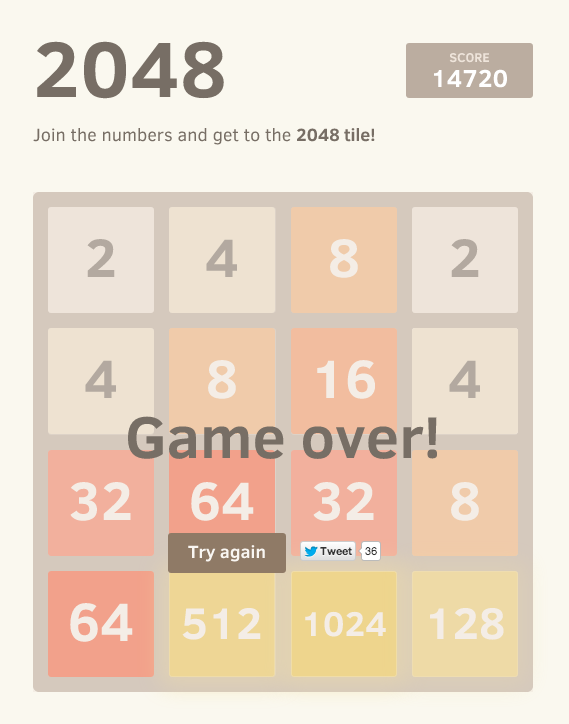 The games I've been inspired by are 1024 and 2048 (the latter is made by a member of a forum I visit). 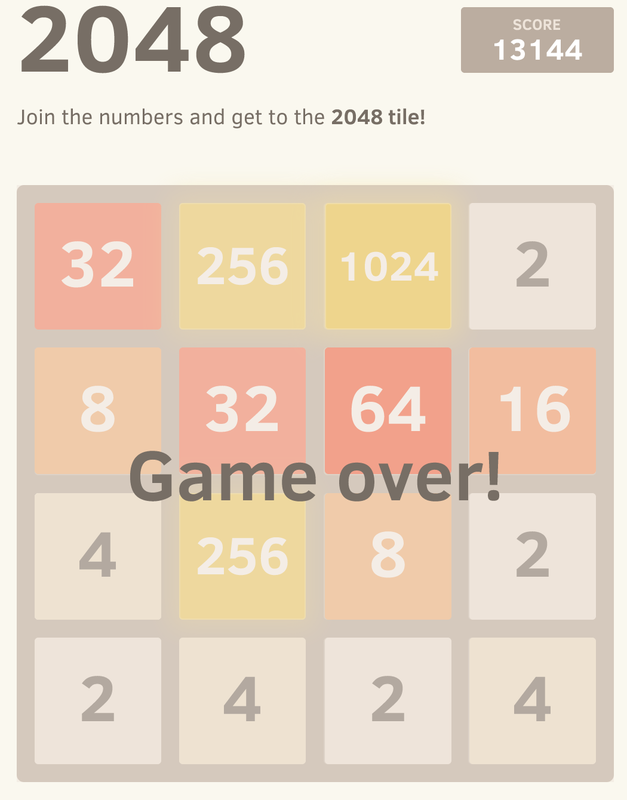 EDIT: It looks like 1024 is a clone of Threes. That'd mean my game is the clone of a clone of a clone. Ohh man I thought I was going to make it to the 2048 square but I slipped. Ended with a score of 5456. Seriously addicting. Good job on the implementation! Is it weird if I pressed random arrow keys and got a 2400+ score? Hey, just noticed the game plays pretty well on mobile safari. Guess I lucked out on iPhone 5 then, heh. Seriously though, you should consider wrapping this up as a native app — or at least optimize to make it a webapp. Just removing screen drag and adding an iOS icon would make it 10x better. Thanks! Make sure not to get too hooked! My...my productivity!!! This is sooooo damn addictive. Excellent work! Thanks for ruining my night's sleep.